In the spirit of multi-national interoperability and joint readiness, a Canadian contingent participated in Exercise DYNAMIC FRONT 2019 (Ex DF19) alongside soldiers from 27 Allied nations from March 1-9. The annual live fire artillery exercise involved approximately 3,200 participants and took place on three fronts: United States Army’s Grafenwoehr Training Area in Germany; Riga, Latvia; and Torun, Poland. Canada was represented by 4th Artillery Regiment (General Support) (4 Regt GS), a Regular Force unit based at 5th Canadian Division Support Base Gagetown, and deployed gunners from the Enhanced Forward Battle Group (eF BG) Latvia. The contingent from 4 Regt (GS) exercised command and control over live fire artillery missions in Germany. They teamed up with New York Army National Guard’s 53rd Digital Liaison Detachment (53rd DLD) to form the 453rd Multi-National Division Artillery Headquarters (453 MN DIVARTY). The headquarters also incorporated staff from other nations, including, Ukraine, Romania, Lithuania, Georgia, the‎ Netherlands, Croatia, Denmark and Azerbaijan. Their role was to plan, synchronize, coordinate, and direct fire from six nations with additional surveillance and target acquisition and air defence assets. Throughout the exercise, these joint fire activities were conducted under the banner of Artillery Systems Cooperation Activities (ASCA), a multi-national operating standard that Canada has recently adopted. “The Canadian Army’s contribution to Ex DF19 helped refine our role as an integral member of the ASCA network, while strengthening our relationships with gunners serving with our Allied nations. Interoperability and joint readiness is all about getting to know your Allies, ensuring you can speak same language on the battlefield in order to execute operational effects when it truly counts,” said Lieutenant Colonel Paul Williams, Commanding Officer, 4 Regt (GS). The professional development and relationship building that took place during this exercise was also well-received by Canada’s international partners. “Our training with the Canadian Army on Ex DF19 was focused on developing standards for Artillery Systems Cooperating Activities which is the common language for Division Artillery organizations across the NATO federated mission network,” said Colonel Patrick Macklin, Commanding Officer of the 53rd DLD. “This training builds joint readiness by enabling staffs to network infrastructure and doctrine with this common language. Interoperability is a fundamental condition of how our armies plan to fight tonight, tomorrow, and in the future,” he said. X Battery of 1st Regiment, Royal Canadian Horse Artillery, currently serving as part of eFP BG Latvia, participated in the exercise by conducting live-fire training missions from their forward deployed location. Throughout the exercise, they served with a Division Artillery organization comprised of soldiers from four nations: the United States, Czech Republic, Latvia and Spain. The Canadian Army contributed artillery assets at the operational and tactical levels and worked closely with multi-national partners to enable learning at all levels. “As Canadian gunners, we are used to operating in very cold temperatures,” said Lieutenant Tyler Gilchrist of eFP BG Latvia. 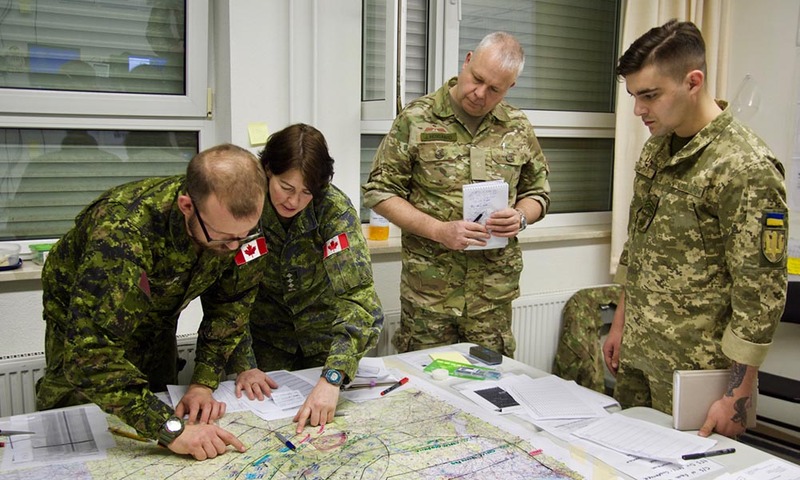 In addition to passing on tactical knowledge that is inherent to being Canadian, Canadian soldiers in Latvia also shared lessons with their international counterparts that go beyond gunnery practices. Serving as representatives of the Canadian Army and ambassadors for Canada, the Canadian gunners who participated in Ex DF 19 left the exercise with some lessons learned and some new friendships which characterized a successful mission for everyone involved.